Home announcements Apple Application Applications game News Updates 15 New Levels And New Red Bird Moved Added To Angry Birds! 15 New Levels And New Red Bird Moved Added To Angry Birds! One of the most popular - the original Angry Birds has received an update recently, challenging players to hit moving targets in new levels with new gameplay! 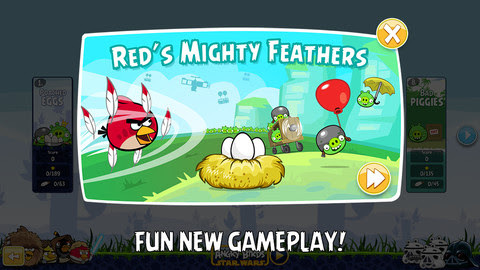 There are whole 15 new levels added to the Red's Mighty Feathers episode! You can download the updated Angry Birds from the Apple App Store! Once tried, do not hesitate to come back and share your progress stories with us in the comments below!